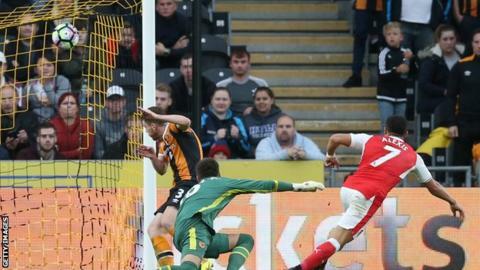 Alexis Sanchez scored twice and missed a penalty as Arsenal comfortably beat 10-man Hull City in the Premier League. Sanchez put Arsenal ahead when he got a touch on Alex Iwobi's shot, but failed from the spot after Jake Livermore handled and was sent off. Theo Walcott added a second after the break before Robert Snodgrass pulled one back for the hosts with a penalty. Sanchez smashed a third into the roof of the net before Granit Xhaka's spectacular shot rounded off the scoring. Sanchez's first goal owed much to fortune rather than brilliance as Iwobi arrived at the back post and saw his effort deflect in off the Chile international. Livermore was shown a straight red card five minutes before half-time when he blocked Coquelin's goal-bound effort with his hands. Sanchez took responsibility for the penalty ahead of recent regular taker Santi Cazorla only to see his low effort saved by Hull goalkeeper Eldin Jakupovic. It was a decision which also mystified Wenger who revealed it was "not planned for Sanchez to take it" and that he wants "to know what happened and for it not to happen again". Walcott notched a second goal shortly before the hour mark when he got on the end of Iwobi's clever flick with Hull defender Harry Maguire helping the ball into the net with his head. Snodgrass gave Hull a glimmer of hope when he converted from the spot after Petr Cech had brought down Dieumerci Mbokani, but Arsenal's response was emphatic. Sanchez struck after Jakupovic had blocked Walcott's initial shot, before substitute Switzerland international Xhaka - a £35m summer signing from Borussia Monchengladbach - applied the gloss with the pick of the goals from distance. After three consecutive Premier League wins for the first time since last Christmas, Arsenal's season now feels properly up and running. Hull made Arsenal work for this victory but the quality in Arsene Wenger's side shone through. Even when he has an off day Sanchez can be a match-winner. These were not particularly classy strikes from the Chilean, but he got the job done. Wenger, in a season when the pressure is on him to deliver silverware, will likely feel there is plenty to build on from this performance. Mike Phelan's side might have been comfortably outclassed by Arsenal here, but the scoreline perhaps flattered the visitors. Whatever the delay is over caretaker manager Phelan's future at the KCOM Stadium, Hull's owners should get it sorted immediately. Phelan has been offered the job permanently but there is speculation he could yet walk away over a dispute about wages. Despite being down to 10 men his side chased every lost cause, scrapped for every 50-50 ball and never threw in the towel. Given the manner in which he has galvanised a side largely in disarray when he took over in July he will be worth every penny to the club. His spindly legs and slim frame make him look like he could be blown over at any moment, but Iwobi showed he can be a key player for Arsenal this season. The 20-year-old occupied pockets of space, used the ball intelligently and had a hand in a couple of Arsenal's goals. Sanchez will get the attention for his goals, but against a physical Hull side Iwobi showed he has the fight and determination to go with his flair. There has been speculation this week that Arsenal will keep Alex Oxlade-Chamberlain waiting on a new contract. Oxlade-Chamberlain might find that he will be playing second fiddle to Iwobi if the youngster produces this kind of performance regularly. "I feel overall it was a positive performance after playing away in the Champions League and away again today. "We started well, dominated and were fluent. They defended well but overall we managed to score the goal, then after the missed penalty we had to be serious and score the next goal." "My future is a lot brighter - 48 hours ago I was offered some terms. Due to this game being up on us, I decided to leave it alone for now. "Hopefully I'll take this club on - I want to be involved and take a great group of players forward. Once we've sorted out the details, we'll make the decision." With two slightly fortuitous goals and a missed penalty Sanchez might seem an odd choice, but the Chile forward should not be judged purely on finding the net. He was uncompromising, ugly and got the job done. Arsenal will win more games if his team-mates follow suit. Both teams have away trips in the third round of the EFL Cup during the week. Arsenal face Championship Nottingham Forest at the City Ground on Tuesday while Hull benefit from a extra day of rest before they travel to the Potteries to play Stoke. Arsenal have won six games at the KCOM Stadium in all competitions - more than any other away side. Hull have lost back-to-back home league games for the first time since May 2015. Sanchez has been involved in eight goals in his five games against Hull in all competitions (six goals, two assists). Sanchez's penalty miss means he is the only Arsenal player to take more than one Premier League penalty and fail to score with any of them. Arsene Wenger's side have not lost any of their past 26 Premier League games against newly promoted sides (W22 D4). Match ends, Hull City 1, Arsenal 4. Second Half ends, Hull City 1, Arsenal 4. Foul by Dieumerci Mbokani (Hull City). Goal! Hull City 1, Arsenal 4. Granit Xhaka (Arsenal) left footed shot from outside the box to the top left corner. Assisted by Mohamed Elneny. Attempt missed. Sam Clucas (Hull City) left footed shot from outside the box is too high. Assisted by Robert Snodgrass. Attempt missed. Francis Coquelin (Arsenal) left footed shot from outside the box is high and wide to the right following a corner. Substitution, Arsenal. Lucas Pérez replaces Theo Walcott. Corner, Arsenal. Conceded by Ryan Mason. Attempt saved. Alexis Sánchez (Arsenal) right footed shot from outside the box is saved in the bottom left corner. Assisted by Granit Xhaka. Goal! Hull City 1, Arsenal 3. Alexis Sánchez (Arsenal) right footed shot from the centre of the box to the top right corner. Attempt saved. Theo Walcott (Arsenal) left footed shot from the centre of the box is saved in the centre of the goal. Offside, Arsenal. Nacho Monreal tries a through ball, but Alexis Sánchez is caught offside. Dieumerci Mbokani (Hull City) wins a free kick in the defensive half. Attempt blocked. Granit Xhaka (Arsenal) left footed shot from outside the box is blocked. Assisted by Héctor Bellerín. Goal! Hull City 1, Arsenal 2. Robert Snodgrass (Hull City) converts the penalty with a left footed shot to the top left corner. Petr Cech (Arsenal) is shown the yellow card for a bad foul. Penalty conceded by Petr Cech (Arsenal) after a foul in the penalty area. Penalty Hull City. Dieumerci Mbokani draws a foul in the penalty area. Substitution, Arsenal. Mohamed Elneny replaces Alex Iwobi. Substitution, Hull City. Dieumerci Mbokani replaces Abel Hernández. Attempt missed. Theo Walcott (Arsenal) right footed shot from outside the box is just a bit too high. Assisted by Granit Xhaka. Attempt blocked. Mesut Özil (Arsenal) left footed shot from the centre of the box is blocked. Assisted by Alex Iwobi. Substitution, Arsenal. Granit Xhaka replaces Santiago Cazorla. Offside, Hull City. Curtis Davies tries a through ball, but Abel Hernández is caught offside. Attempt blocked. Robert Snodgrass (Hull City) left footed shot from outside the box is blocked. Harry Maguire (Hull City) wins a free kick in the attacking half. Offside, Hull City. Sam Clucas tries a through ball, but Abel Hernández is caught offside. Attempt missed. Santiago Cazorla (Arsenal) left footed shot from the left side of the box misses to the right. Assisted by Mesut Özil. Substitution, Hull City. Ryan Mason replaces Tom Huddlestone. Offside, Hull City. Eldin Jakupovic tries a through ball, but Abel Hernández is caught offside. Goal! Hull City 0, Arsenal 2. Theo Walcott (Arsenal) right footed shot from the right side of the box to the bottom right corner. Assisted by Alex Iwobi with a through ball. Attempt blocked. David Meyler (Hull City) right footed shot from outside the box is blocked. Assisted by Tom Huddlestone.